Skinactive14™ regenerating night cream - the compact solution for 14 general skin aging problems – overnight regeneration and basic care for 14 skin aging problems! Feel the difference after the first application! Dry skin, small creases and wrinkles, weak structure, loss of firmness and elasticity, uneven skin tone, redness and sun spots, thin, transparent, rough, dull and stressed skin, enlarged pores, lacking radiance. Skinactive14™ Regenerating Night Cream – Developed to Regenerate the Skin Overnight. Skinactive14™ regenerating night cream contains 5 concentrated cosmetic ingredients that, combined, provide the skin with the essential basic care it need overnight – after just one application. The result? An intensive moisturizing care, anti-aging and rejuvenation components that help make the skin look more youthful. Aquafill: Aquafill is a natural active ingredient that fills out wrinkles and minimizes the appearance of pores. This effect is caused by MoistureTrap™ technology and maintains the moisture in the skin. Sepilift DPHP: A moisturizing anti-aging ingredient that reduces and tightens wrinkles. It intensifies the resistance of anti-aging properties in the cells and has an effect on the enzymes that are responsible for skin aging. Rovisome ACE Plus: A combination of vitamins A, C and E. The fact that the vitamins are encapsulated enables their effect to go deeper into the skin. Vitamin A supports the enzyme activity in the skin and increases the collagen content. Vitamin E and C make a good combination for scavenging radicals, preventing skin aging caused by UV radiation. After using other Skin Doctors™ products gently massage Skinactive14™ regenerating night cream into your skin. Should I use an additional night care product? 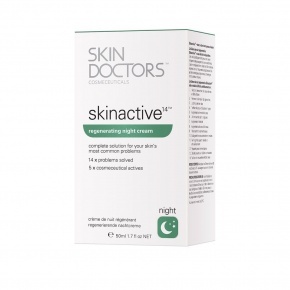 Skinactive14™ regenerating night cream is the daily basic solution for numerous skin problems. However, the process of aging is something that will increase your amount of skin problems, meaning you will require a more intensive specific type of treatment. 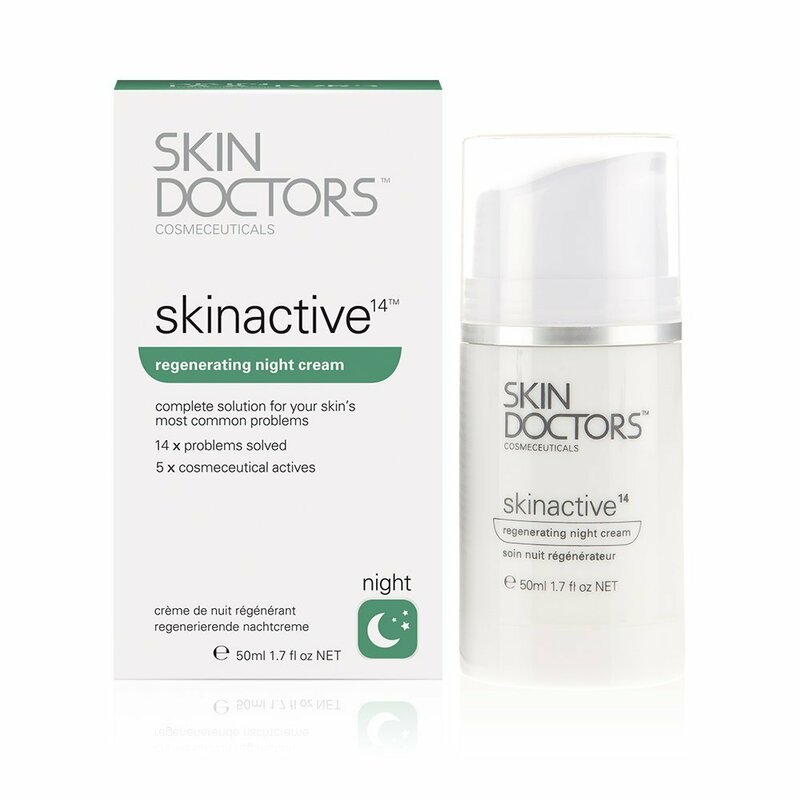 SKIN DOCTORS™ has a wide variety of products that you can combine with Skinactive14™ regenerating night cream. What makes Skinactive14™ regenerating night cream different to other creams? Skinactive14™ regenerating night is a lot more than just a daily moisturizing cream. No other cream provides such a unique combination of 5 active ingredients that create a youthful radiant look. How do I achieve the best results? Skinactive14™ regenerating night cream contains everything that your skin needs throughout the night to stay protected and well-kept. To achieve even better results we recommend you also use our Skinactive14™ intensive day cream product.